Even though I’m not the biggest opera fan, there are enough features and fun, innovative ideas to keep me entertained with Opera Night slot. It is also fun trying to work out who each of the iconic symbols really is, so as to put a name to a symbol face. The curtains open and the Viking warrior-ess opera singer, dressed in a Madonna bra comes out on stage for the conductor to begin the performance. She reaches such high notes that she shatters his glasses, and he does not look too amused. Deeply dark and mysterious music begins as we are introduced to the reels. It's not gonna be over 'til the fat lady sings again, that’s for sure! Once you start spinning the reels, the music is lightened with some upbeat and twinkly style sounds. 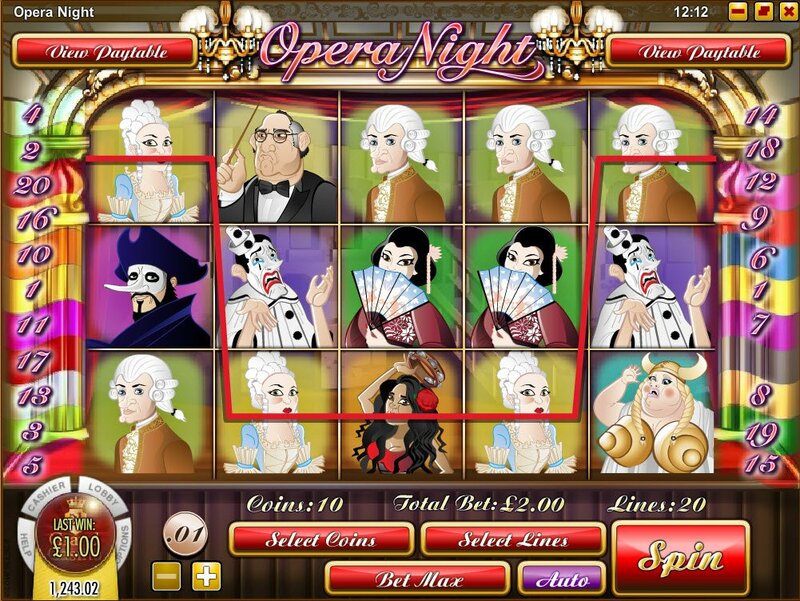 I'm not exactly an opera goer so, I don't recognise all of the characters from the 18th century portrayed here as our Opera Night 5-reel 20 payline slot symbols but, from the ones I do recognise. Madame Butterfly, Mozart and Carmen symbols are all most certainly present to help you reel in those coins. 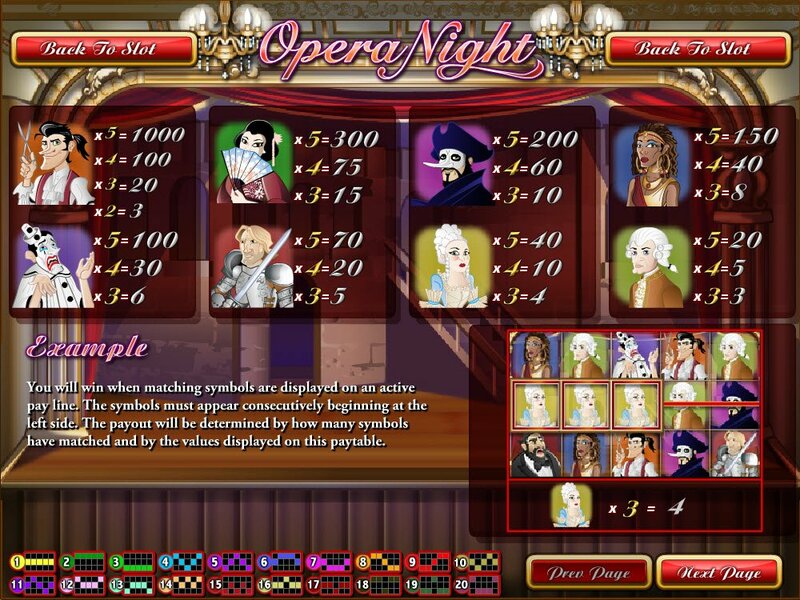 Opera Night slot is packed full with fun features, designed to keep you enjoying opera night, even if you have no appreciation for composers and singers and the finery they dress in. 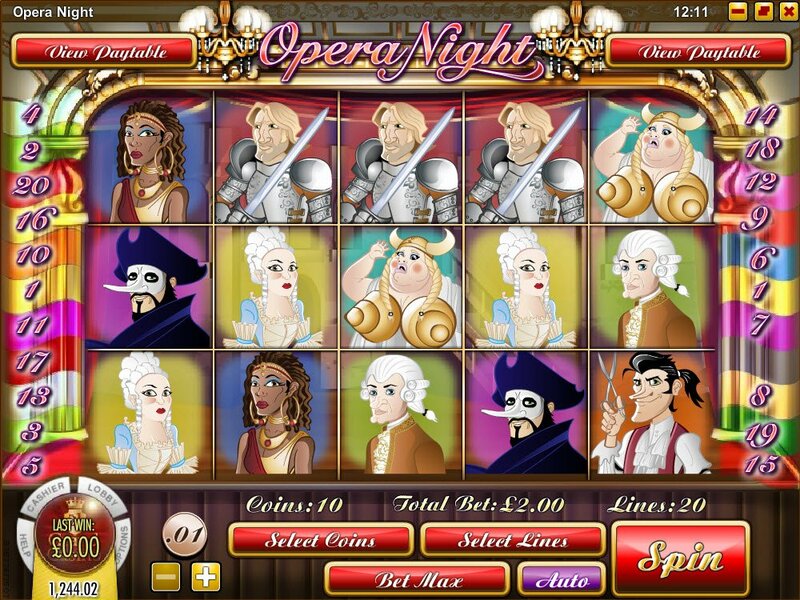 The Opera Night Slot jackpot is Pavarotti himself and, roll in 5 of him and you'll net yourself a whole 2000 coins. It's not gonna be over 'til the fat lady sings again, that’s for sure! The Viking lady, perhaps some iconic treasure of the opera, unknown to me, is the trigger for our bonus round and, more glass will be shattered in that, no doubt. You will be taken to the Viking singer's stage to guess what pitch she will sing at and, if you manage to pick the volume before the wine glasses break, you can win a nice chunk of coins to keep you spinning those reels. The conductor symbol is our Opera Night wild symbol and, the more of him you spin, the more free spins you are rewarded with. The niftiest feature in Opera Night is the Opera Drop. Our masked figure is the foreboding symbol and, three or more of him will mysteriously disappear to let the above reel symbols fall into his places.